An interactive exhibition of young peoples wildlife inspired films, photos and video games made at Fingringhoe Wick with Signals. 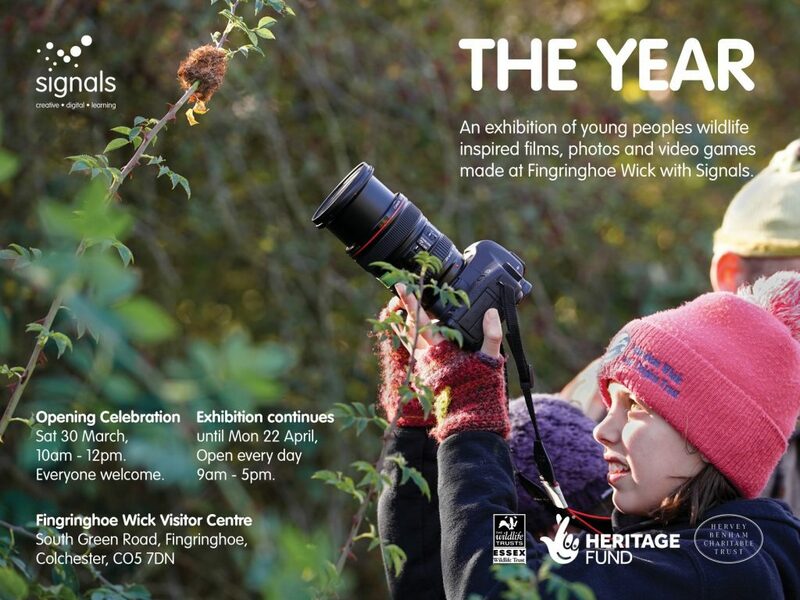 The Year exhibition is FREE and runs from Saturday 30th March to Monday 22nd April at Fingringhoe Wick Nature Reserve Visitors Centre. From Spring 2018 to Spring 2019, Signals ran over 50 creative workshops for young people at Fingringhoe Wick Nature Reserve. ‘The Year’ was 12 months of workshops where we explored various stories from the reserve, including the singing Nightingales of Spring, the basking Adders of Summer, the boisterous badgers of Autumn and the visiting wading birds of Winter. ‘The Year’ encouraged young people to embrace and explore the natural heritage of the reserve through creativity. This exhibition showcases some of our favourite stories from the reserve as well as the incredible work made by the young people involved, including: photography, filmmaking, wild writing and even an arcade machine of wildlife themed video games. The Year is a heritage conservation project funded by the Heritage Lottery Fund and Hervey Benham Charitable Trust, and delivered by Signals. The project has been organised at the Fingringhoe Wick Nature Reserve, part of the Essex Wildlife Trust, which protects and cares for wildlife and wild places across Essex.